Designed by musicians for musicians, Melody Mate helps you practise and transcribe your favourite tunes by letting you change the speed and pitch independently of one another. You can add any number of loops so you can repeat sections you're working on or drop markers so you can easily return to the right place. You can also delay the start of playback so you have time to get ready. The clean, uncluttered interface makes all the functionality easily and instantly accessible. Drag sliders to set speed and pitch, drag and drop to create new loops and markers or tap to add them at the current playhead position. Melody Mate is the perfect speed and ear training tool for all amateur or professional musicians and an invaluable addition to the rehearsal environment, making your practice time more dynamic and productive. -	If you're learning or transcribing a tune, slow it down so you can easily practise at your own pace, or work out your favourite solos note for note. -	Gradually build speed as you gain confidence with a tune. 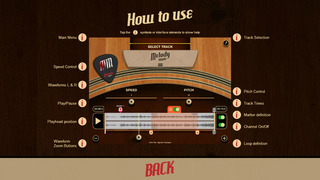 -	Create loops so you can play through any section time after time until you've got it. If you want to play through without looping but want to keep your loop definition for later use, no problem! You can switch them on or off as needed. -	Drop markers at locations you want to return to. -	If a recording isn't quite in concert pitch - or if you're not - use fine pitch mode to match playback to your tuning rather than the other way around. -	For singers, change the key of a song to move it into your vocal range, or just to see how it will sound in different keys. -	If the instrument you're interested in is in one channel of a stereo track more than the other you can switch the other channel off to isolate it better. -	Delay the start of playback for up to 5 seconds so you've got time to get ready. 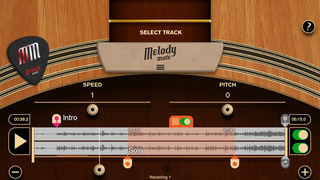 Download Melody Mate now to get started. We would love to hear from our customers. Contact us with your questions and suggestions!